This week brings more information on the economy’s performance including Friday’s August employment report. The rise in volatility comes just weeks before the Federal Reserve (Fed) is expected to decide on the timing of the first rate increase in a decade. 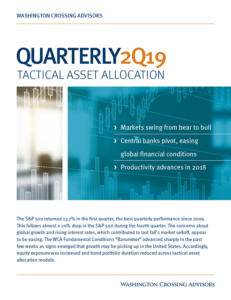 Consequently, the focus will be on how the recent spike in market volatility is sustained and to what extent it feeds back into the real economy. While last week’s tumult is probably too recent to register much of an impact on the employment report, each new piece of information from here will be evaluated from the perspective of how market events are (or are not) impacting the real economy. This interaction will play an important role in setting policy. Markets are set to start the week to the downside, as global markets wrestle with weaker global growth and the idea that the Fed continues to actively consider a rate increase at their September 17 meeting. Over the weekend, Federal Reserve Vice Chairman Stanley Fisher said that inflationary pressures were expected to increase and that it was too soon to judge whether the recent pickup in volatility is sufficient to warrant a delay in increasing rates. His remarks were more hawkish than Bill Dudley’s comments last week who said it was unlikely that rates would rise in September. Bill Dudley is the president of the New York Federal Reserve. What we know so far is that the U.S. economy is faring better compared to earlier performance and compared to many foreign economies. The Commerce Department recently reported that U.S. Gross Domestic Product (GDP) rose by 3.7% in the second quarter, up from a near-zero growth rate in the first quarter. Moreover, most of the data we have for the third quarter suggests that the domestic economy continues to make progress. Private survey forecasts for the third quarter stand near 2.75% (trending lower) and the Atlanta Fed’s GDP Now forecast of 1.75% (trending higher). This Friday we will get a look at employment trends for August, and expectations are for growth of 215,000 jobs with the unemployment report holding steady near 5.3% — a level close to what some economists consider “full employment”. What happens from here will depend largely on how financial markets respond to anticipated Fed tightening and slowing global growth. To some extent these are already priced in to various markets. The dollar has already appreciated against most other currencies over the past year or so, despite some recent weakening. Commodity prices have been under pressure for months. Credit spreads have widened. To the extent that the dollar’s strength is largely behind us or to the extent that low commodity prices convey benefits to consumers, the past movement of the dollar and commodities could provide a reservoir of future benefits, and this is our base case scenario. If, however, expectations for growth or investor psychology becomes impaired, the flow of credit from the financial sector to the real economy could become impaired. This is the risk case and the one we need to be mindful of as the process of adjustment plays out. We do not know whether the recent spike in volatility lingers and becomes more entrenched or whether it passes quickly. So long as the pickup in volatility does not damage psychology and growth, the recent pickup should be seen as a buying opportunity, especially for the United States where growth has remained relatively steady. We monitor for changes in direction through analysis of incoming data. At present, we see a the incoming data as mixed. Some of the data shows steady improvement, as evidenced in a pickup in U.S. GDP growth, manufacturing, and employment trends. Other trends are less compelling, especially those relating to foreign growth and commodity sensitive areas. Consequently, the composite picture appears mixed and portfolios are tactically allocated near their long-run policy weights and exposures. 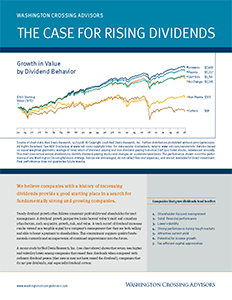 For individual equities, we continue to move toward issues that demonstrate consistency in underlying cash flow and earnings. A pickup in volatility is to be expected, given the nature of volatility to ebb-and-flow from cycle to cycle. We have existed in a low-volatility/high-return world in recent years. Long-run returns are likely to drift lower, as volatility moves back toward its historic average as well.